A bit chilly today but that didn’t stop Jonelle Richards from scoring a 10 from one judge in the CCI2* class….we’re very impressed!!!!! We saw some lovely tests again today, with action in the CIC3*, CIC2*, CCNP** and the Michael Leonard Championship classes. Australia’s Kevin McNab took the lead today in the Johnson & Perrott CIC3* class. He heads out tomorrow on 36.2, with Brookfield de Bouncer and Pippa Funnell (GBR) isn’t far behind with Second Supreme on 39.6. 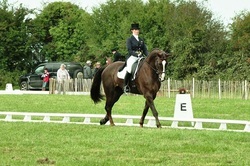 In 3rd place overnight is Kelly Aldous (GBR) with High Garth High Flyer on a dressage score of 40.6. Sarah Ennis is best of the Irish in this class, finishing today in 4th place on 43.0, with Stellor Rebound. Elisabeth Halliday-Sharp (GBR) is in 5th spot (HHS Cooley – 43.2) and in joint 6th on a score of 44.2 are Patricia Ryan (IRL), with Tullineaskey Hi Ho and Kevin McNab, with Kelecyn Cognac. The Castlemartyr Resort CIC2* class is very highly contested, with less than 4 penalties separating the top 5 riders. We’ll be watching this bunch very closely tomorrow! In the lead overnight is Jonelle Richards (GBR), with Aloha, on 37.8. Fraser Duffy (IRL) is just behind on 38.9 (Fernhill Revelation) and Camilla Speirs (IRL) is on 39.3 (welcome back to Portersize Just a Jiff!). Kevin McNab is lying 4th (Brookfield Cult King – 41.5), Michael Ryan is 5th (Ballylynch Wizard – 41.7) and Pippa Funnell is in 6th with Sandman 7, on 44.1. They’re all very close at the top of the Amber Michael Leonard 5/6 year old Championship. It will be interesting to see how these young horses handle the cross country! The top 6 placings overnight are Sarah Ennis (Bridgemans Cocoa Malt – 23.3), Michelle Kenny (Limbo Kaiser – 24.0), Elizabeth Power (Soladoun – 25.0), Patricia Ryan (Kilpipe Jewel – 25.3), Heidi Hamilton (Dam Easy – 26.7) and Cathal Daniels (Camee – 27.2). Isabelle Odlum is in front in the Hyde Equine CCNP2* class, with Blue Venture, on 49.8. Holly Malone Morrissey is on 54.0, with Shalom Marlboro and Sophie Buller is right behind her on 54.3, with G Maha. Good luck everyone tomorrow….we’all be watching!! !